ILWU Must Enforce Safety Rules! OAKLAND—Half an hour before the day shift at the Port of Oakland ended on September 24, 39-year-old Reginald Ross was struck and killed by a 15-ton container being loaded onto the Stuttgart Express by a crane at the Stevedoring Services of America (SSA) terminal. As the news spread, stunned International Longshore and Warehouse Union (ILWU) Local 10 members walked off the job and refused to resume work, shutting down the port for the next 36 hours. In response, the employers Pacific Maritime Association (PMA) rushed to obtain an arbitrators ruling against Local 10 for stopping work to mourn Ross death. Some 150 port workers later turned out for his funeral on October 5. Ross, a black casual worker whose father and grandfather were Local 10 longshoremen, is dead because he was made to work in open violation of the safety code. He was fully conscious as rescuers struggled for an hour to remove him from the ship, with his pelvis crushed and ribs broken. Ross later died at the hospital, leaving behind his wife, girlfriend and four daughters. Ross had been dispatched as a lasher. Lashers use heavy metal rods and connectors to fasten containers to the deck of the ship. Ross was standing in the ship walkway when fatally injured. The Pacific Coast Maritime Safety Code, which is part of the contract between the ILWU and the PMA, says that lashers should never be anywhere in the area under or adjacent to where a crane is loading or unloading containers. But a number of Local 10 longshoremen told Workers Vanguard that this essential safety rule is routinely violated in the Oakland port, where companies expect lashers to work under the crane. That the ILWU Local 10 tops allow such a situation to continue is criminal. An Oakland port spokeswoman insisted in the Oakland Tribune, In more than seven years, this is the first time Im aware of a fatal injury accident of a longshore worker. In reality, the shipping bosses create the conditions that make longshore work dangerous and accept and expect a high rate of injury and death. Local 10 member Robert Padgett was killed in January 2005 when a walkway collapsed under him and he plunged 30 feet onto the deck of a cargo ship (see Shipping Booms, Longshoremen Die, WV No. 842, 18 February 2005). But that death occurred across the Bay, in Redwood City, so the Oakland shipping bosses choose to disappear it. The San Francisco Bay Area ports moved a record 1,651,811 TEUs (20-foot container equivalents) last year, compared to 1,208,830 in 2002. In order to move more containers at a faster pace, the PMA bosses ride roughshod over safety rules. There were 10 fatalities in the West Coast ports from 2002 to 2005, and 6,035 injuries resulting in time lost on the job. Ross death is at least the sixth fatality in the West Coast ports (including Canada) in the last two years, according to accounts in the ILWU Dispatcher. Longshore workers on the West Coast, through the hard class battles of the 1930s, won the union hiring hall and some control over job conditions, making the work qualitatively safer. But the PMA has been trying to reverse those gains ever since. Containerization in the 1960s and 70s sped up the loading process while massively reducing the workforce and prolonging shifts from six to eight hours. With heavy equipment moving huge containers rapidly around the docks, the rate of serious injury has increased. In the tug-of-war between protecting workers lives and boosting capitalist profits, the main weapon workers have to defend themselves is the union. The work stoppage in honor of Ross resulted in a major cargo backlog, pointing to the enormous social power wielded by port workers. But far from using the unions power to defend the safety of the membership, the ILWU bureaucrats have done precious little to ensure safety codes are enforced. Instead, Local 10 officials blame the workers for ripping and running (working fast in violation of safety rules). Meanwhile, longshoremen tell us that there arent any ILWU safety reps on the job, and the local safety committees are joint PMA-union. The situation on the docks is made worse by divisions of the workforce by seniority classification for access to jobs. Only A men are members of the union. The B men are left with the jobs not taken by the A men, who routinely work double or triple shifts before B men get out. In addition, there are highly skilled steady men on permanent contract with a particular employer in return for guaranteed hours and pay. Unregistered casuals are dispatched behind B men only when there are a lot of jobs to fill. Thus, casuals like Ross work much less, have much less experience and often get the most onerous jobs. All working longshoremen should be full members of the union! No doubling! Shorten the work shifts back to six hours work for eight hours pay! Steady men back to the hiring hall! Across the country, every year thousands of workers are killed on the job, and millions more are injured. For the profit-hungry capitalists, the lives of their wage slaves are cheap. Only when the working class rips industry from the hands of the capitalists and establishes a planned socialist economy will safety govern working conditions. 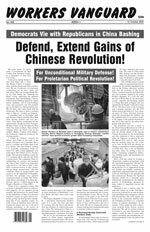 Defend, Extend Gains of Chinese Revolution! Paris Rally Demands: Free Mumia Abu-Jamal!